Back to school time is here and it’s that time of the year to help students and educators stay safe online by protecting computers and laptops from harmful digital threats such as ransomware, malware, and virus. "What is the big deal about this thing?" According to a survey conducted by Intel Security in the United Kingdom (UK) with 1,000 students, half of them have no security software installed on any of their devices. Windows devices, especially desktops and laptops, contain information important information and by tapping onto any available public Wi-Fi to go online, students and educators are exposing their PC to more potential digital risks. The consequences of the devices becoming infected can have a real and unfortunate impact on a student’s or educator’s performance on campus. Imagine losing all the assignments that students have done so far, or worse, losing student personal information which hackers can use as a potential threat. Click with caution: be careful of the link or attachment that you are clicking. If the offer from the site seems too good to be true, they probably are not. Use a strong password: This includes a combination of number, symbols, upper-case and lower-case letters to make the password harder to crack. This way the hackers have no way into your email or social media accounts. Use an up-to-date program: Updating your programs regularly helps to reduce the possible vulnerabilities (e.g. Zero Day Threats) that hackers can exploit on your system. But these best practices provide only passive protection against digital threats on campus. Students and educators have known that a reliable anti-virus is the one active form of digital protection that they need that is both familiar and accessible with many resorting to free options that may not be adequate enough to stop the latest threats to ever hit educational institutions. We strongly believe that students and educators alike are in strong need of better computer protection so SecureAge Technology is offering 3 years of free SecureAPlus Antivirus for student and educators when they sign up with their school email today. With the SecureAPlus antivirus, students get more than 10 trusted anti-virus engines to detect new and advanced virus or malware that current single anti-virus engine may miss. Also, students and especially educators can control which program can run on Windows PC devices which means, untrusted applications that try to run without permission like executable ransomware and fileless malware attacks, will be blocked. Only 3 simple steps are required to redeem your free education license. Download and install SecureAPlus on your PC. Open SecureAPlus and go to “Info & Licenses” found at the bottom menu bar. You will be directed to the “Account” page. Simply sign up for a new account with your school email*. Congratulations! You will then get notified of the free 3-year upgrade upon a successful login. In today’s increasingly connected learning environment, back to school time not only mean students and educators spend more time on campus to learn or impart new knowledge and skills. It also means getting back to defending against common digital threats online and on-campus. 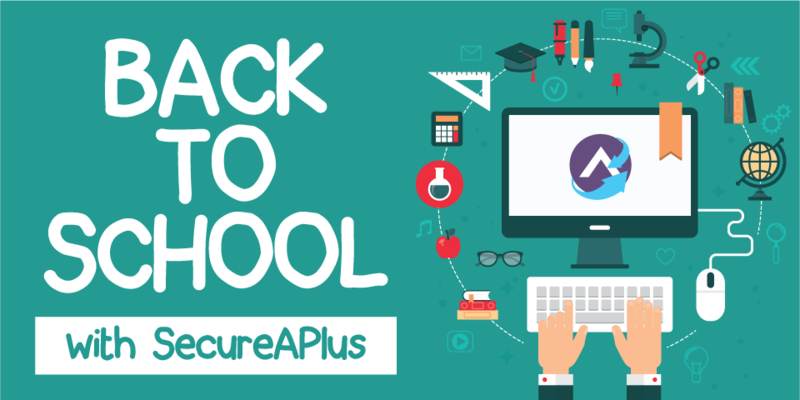 With these risks in mind, the SecureAPlus team is committed to protecting the hard work of students and educators to help secure a better future. * Email domain suffixes that support automatic Freemium license upgrades upon creation are .edu & .ac only at present. If your school uses a different domain suffix, please contact SecureAPlus directly.